Your Daily Len is an email list that delivers a link to the Steal My Sunshine video to your inbox every morning using Nodemailer and Crontab. It is my greatest creation. chs-tonight is a passion project I started when I was still living in Charleston, SC. It is essentially a collection of scrapers the collect event data from a number of bar, theatres, and other venues around Charleston. The data is stored and presented in such a way that you can visit the website and see at a glance what is happening around Charleston over the coming week. The whole process is 100% autonomous (once a scraper for a venue is written, of course) and the page is hosted on GitHub Pages. The project is still in development and I'd love to accept your pull request if you feel like adding a scraper, resolving an issue, or whatever else. After I moved to NYC, I got pretty interested in CitiBike. I saw that CitiBike hosts their trip history on their website, so I thought it would be cool to visualize it. This was my first real foray into using canvas, and I think it turned out pretty well. It may not be extremely informative, but it creates videos that look pretty neat. Not content with the visualization project, I built a little app with Koa and Leaflet that tracks CitiBike stations throughout New York. 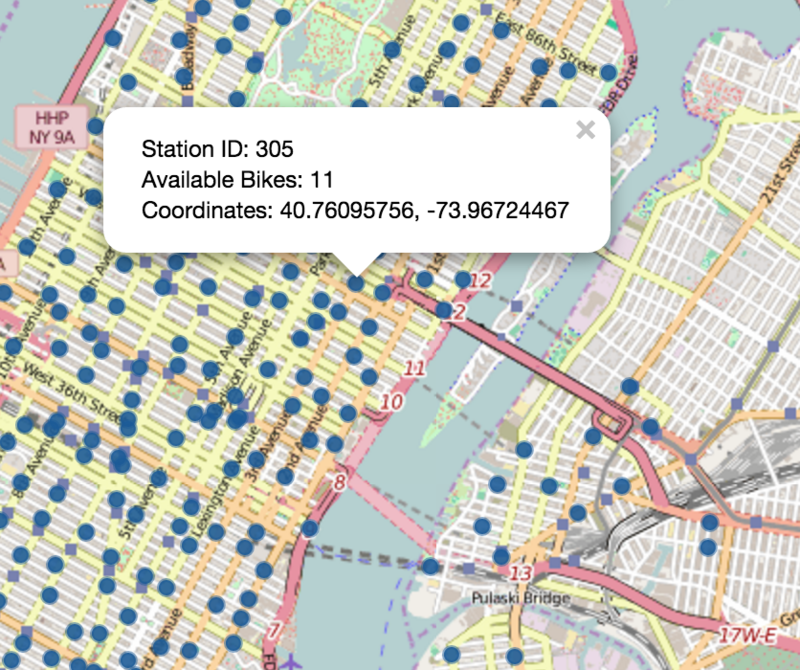 As you can see, if shows the ID, coordinates, and number of available bikes for each station. See the repo Readme for instructions on how to run it. Also available in vanilla Node! This is a small thing that calculates a Flesch-Kinkaid readability score for the text you write in the box. It exists because I wanted to mess around with AngularJS and this was the first thing I thought of! Perfect for people who want to get a readability score for their documents, but don't want to use their word processor's built in calculator.